but also as a “presentation air”. There has never been just one horsemanship. The use of the horse for different needs, and by peoples who lived in different latitudes, led to the development of different techniques, which co-existed in the same era, sometimes influencing each other. 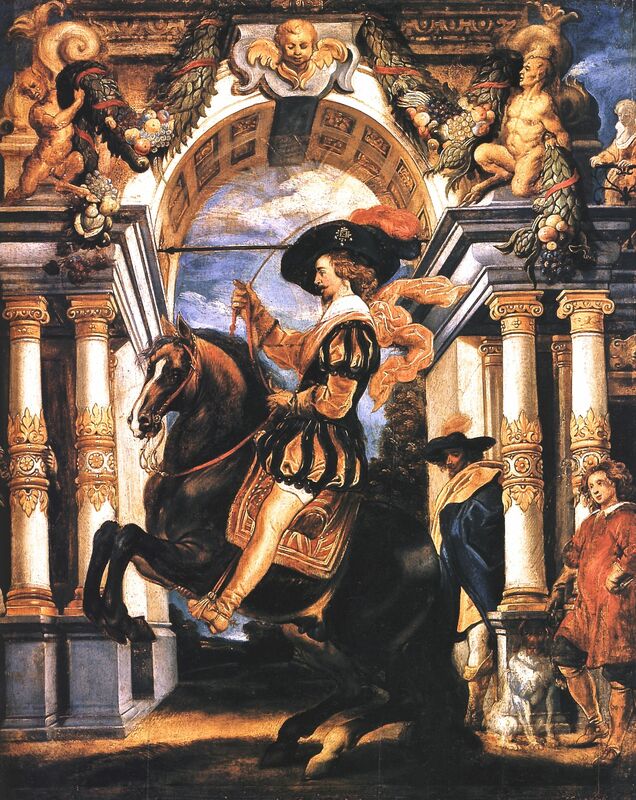 Therefore, trying to identify the features of the equestrian art in a given time is always somewhat arbitrary. But it is also true that the widespread circulation of the first printed equestrian treatises in Europe in the mid-sixteenth century, significantly contributed to standardize the equestrian practices and to establish a “canon” of exercises which remained in force for more than a century, identifying the “good standard” of Renaissance equitation. 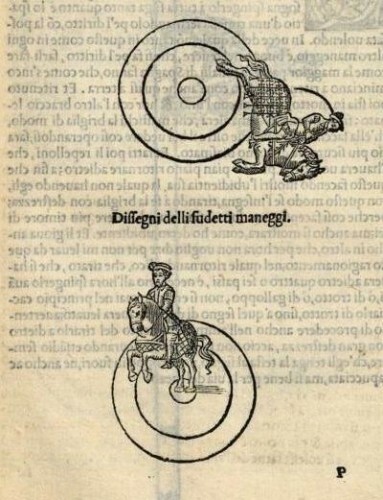 It was especially Cesare Fiaschi, from Ferrara, author in 1556 of the Trattato dell’imbrigliare, atteggiare, e ferrare cavalli (Treatise on bridling, training and shoeing horses) to systematize the different practices in use at the time, establishing rules that can be found to be substantially identical in the treatises which followed in the second half of the sixteenth century. Fiaschi not only listed and described in words the different exercises, but tried to make his explanation clearer through drawings that showed the attitude of horse and rider, in addition to the outline of the path they followed. 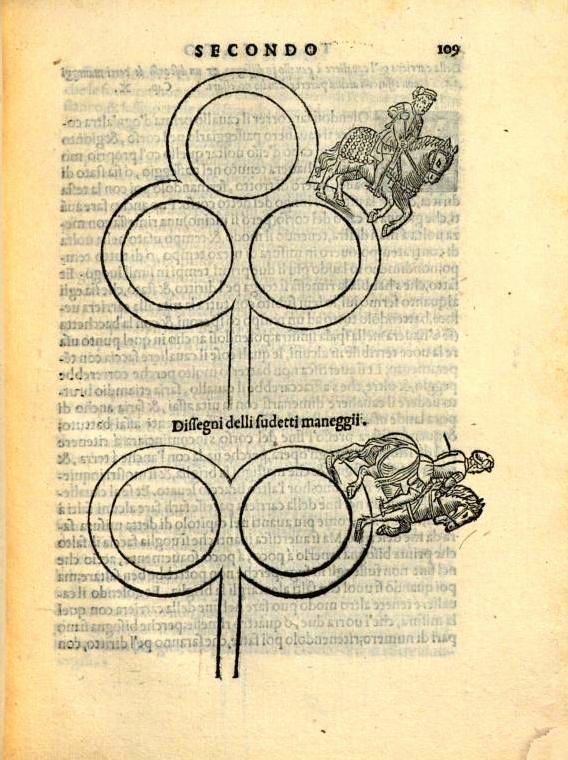 Unique to Fiaschi’s treatise is that the explanation of some exercises is not only accompanied by the plan showing the layout of the exercise and the image of the horse and rider who perform it, but also a musical score that indicates the rhythm of the exercise. The rider had to sing while performing the exercise, or at least he had to keep the musical measure of the melody in his mind. Fiaschi, 1556, Plate introducing the Second part of the book. The exercises indicated by Fiaschi can be divided into two main categories: those related primarily to a military purpose, the so-called “maneggi”, and those with a more aesthetic and virtuosic trait, which we might call “presentation airs” which consisted, for the most part, in what we now call “school jumps”, or “airs above the ground.” In this article we will deal with the first, i.e. the “maneggi,” deferring further description and explanation of the “jumps” to a subsequent article. With the term “maneggi”, Fiaschi and other Renaissance authors intended to include different variations of what, in more recent times, was called in the French style, passade. It was a fundamental exercise in the art of fighting on horseback which consisted of cantering on a straight line (which the Italian authors called “repolone”), after which the animal had to stop and turn in the shortest possible space, in order to immediately run another charge in the opposite direction. It served the purpose to go against the enemy – armed with a lance, a sword, or a pistol – and to attack him again after the first ecounter. In order to turn the horse in the shortest space and as quickly as possible, he was stopped at the end of the charge ​​with the so-called “posate”. The horse was induced to collect the canter more and more, bringing the weight on the haunches, relieving the front legs until he lifted up from the ground, at which point he was turned, pivoting on the hind legs. Even in this case, the French terminology has prevailed over the centuries and, what the Italian masters called “posata”, is now more familiar to us with the name of pesade. The “maneggio di contra tempo” (air of counter-time). According to a classification already present in the previous treatise by Federico Grisone, Ordini di cavalcare (Orders of riding, 1550), Fiaschi distinguished the different maneggi depending on the way the horse was stopped and of the way the half-volte, at the end of the repolone. was performed. He then listed the “maneggio di contra tempo” (air of counter-time), in which the horse was first held in the direction opposite from that in which he had ultimately to do the volte, and was then turned on the straight line with a half pirouette. The “maneggio di mezzo tempo” (of half time). Then followed the maneggi “di mezzo tempo” (of half time) and “di tutto tempo” (of full time), in which the horse performed one or more pesade at the end of the straight line and then turned on his hind legs performing, also in this case, a half pirouette. The “maneggio detto volte ingannate” (the so-called misleading voltes) was then particularly curious. It consisted of pretending to turn at the end of the straight line to one side and then performing the half pirouette to the other side, creating a quick change of direction. The “maneggio di una volta e mezza” (air of one volte and a half). 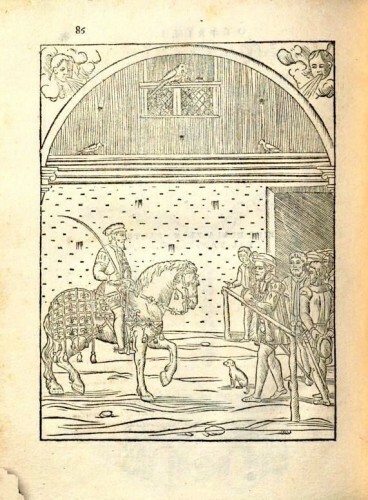 Then followed the “maneggio con una volta e mezza” (with one and a half volte) – in which the horse performed a full pirouette and half before heading in the opposite direction from which he came – and the maneggio called “volta d’anche” (volte of haunches), in which the horse performed a reverse pirouette on the front legs. This last type of exercise was considered particularly useful for “tilts” (jousts that were held with a wooden barrier that separated the contestants) and duels, because it allowed the rider to overtake the opponent from behind, while he was still turning his mount. The “volta d’anche” (volte of haunches) was considered particularly useful in jousts and duels. 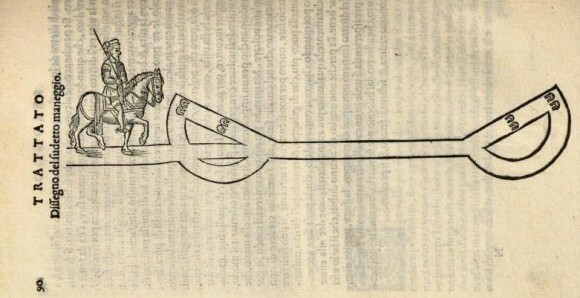 It is clear that the distinction of these different ways of performing the same exercise of the repolone, or passade, did not have an immediate utility on the battlefield, or in the course of a joust (maybe just with the exception of the “volte of haunches”), but rather represented a stylization to bring out the degree of obedience of the horse and the skill and expertise of the rider. 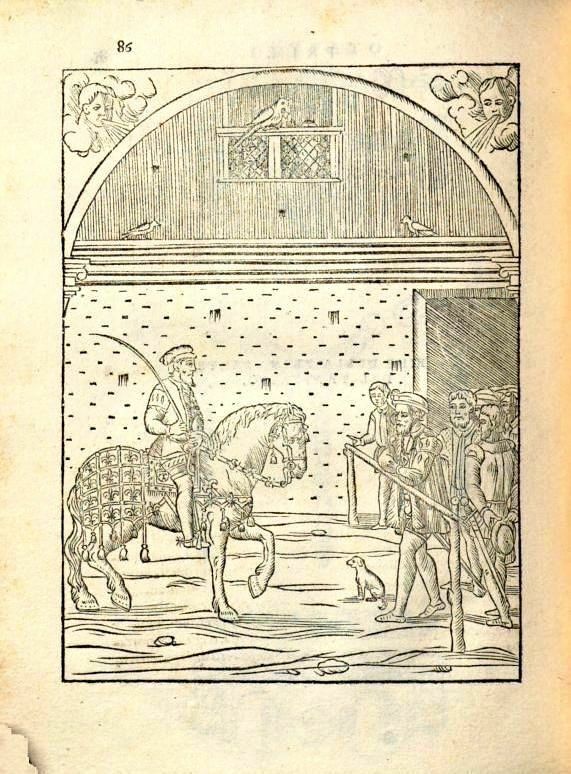 It is in fact hard to imagine that during a confrontation in which a knight in armor risked his life, he could take care of performing a “half-time” or a “misleading volte”, while it is likely that these different exercises were used ​​in the training phase, to refine the docility and readiness of the animal, and on public occasions, to make the skill of the rider shine. Fiaschi also indicated some exercises still in use in modern dressage. The first is that of the “volte raddoppiate” (doubled voltes). It was what today we call pirouette. From the description of the author, we can recognize the characteristic aid of the outside leg, which contains the haunches, in order to make the horse pivot on the inside hind leg. what we now call pirouette. to train both young and old horses. Thank you Gerd! I’m very glad you like it and I hope you will keep on following my blog.